This monthly update on using books and STEM has turned into the best posts to help first and second-grade teachers. Today, you will have five book suggestions, five challenges, and the directions for trying them! Have fun! Oh, how the first graders loved this book. It's the story of Officer Buckle who visits schools for talks about safety. The problem is - he's boring. Until one day he shows up with his dog, Gloria. Suddenly, his shows are getting a lot of attention and the kids are fascinated. Officer Buckle doesn't know that in the background Gloria is turning flips, imitating him, and just being silly. He can't see her, but the kids in the audience can! My first graders loved her! This was probably the first time all year that I had their full attention. Magic, right? So, of course, we had to build a doghouse! STEM Challenge: Build a doghouse for Gloria! Each group had 12 craft sticks, 20 interlocking cubes, masking tape, and scrap paper. We used a plastic counting bear for our "dog" and the kids were fine with that. If you have some small dog figures it would be even better. The doghouses were all shapes and sizes and each had a story behind it. The smallest engineers love to make up stories about their designs. These cubes have round connectors and I like those better for little hands. The ones with square connectors seem harder to snap together. "Oh the magic hat, the magic hat, it moved like this, it moved like that!" I guess I don't have to tell you that your first and second-graders will sing that line, too! First graders were told to think about what they might turn into if the magic hat landed on their heads and then build that animal. Each group had modeling dough, pipe cleaners, big googly eyes, and scrap paper. Pictured above: a large spider and a pink flamingo. Below: a frog (I think) and a lizard (it has scales). "I love my red shoes, I love my red shoes...."
Just change the color each time! The kids loved this book and sang every line. Honestly, is there anything more magical than kids singing? Can you build a shoe? The STEM challenge was to build a new shoe for Pete and it needed to be decorated as if he has stepped in something. I fully expected to get a shoe that had stepped in 'poo', but no one did that! Materials were cardboard tubes, scrap paper, string, tape. I also thought the kids would make the shoe out of the tube, but most of them made that tube a leg! The page we liked best was the longest jellyfish. This creature is actually 200 feet long and to show it the book had the picture covering three pages! The kids loved it when I had to stand up to share the picture. This is what I meant earlier in this post when I said to only mention parts of a book. It's perfectly okay not to read the entire book. Sometimes, you don't have time! So focus on the pages that will lead to the STEM task- in this case, it was that fabulous jellyfish page! Each group had cardboard, tissue paper, tape, and markers. The cardboard we used is from a craft store's cake decorating department and it was already round. You can use any cardboard, but I would suggest cardboard and not just posterboard. It needs to be sturdy. Above you can see the kids tracing the cardboard to make round pieces of tissue. They also used tissue paper to "stuff" the jellyfish body. Of course, they also cut streamers for the jellyfish tentacles! These turned out so great! They made a fabulous display hanging in the hallway! Quite a 'magical' little underwater scene! Have you read this book? Oh. My. Goodness. I picked it up and skimmed through it and then just knew the kids would LOVE it! They did, but only after I explained what it means to reach into the back of the chair (under the cushions) and find things. Many of the second graders had never done this and did not know they might find treasures under the seat cushions or stuck in the back of the chair! "Why don't you do what we do? Just reach into the back of the chair!" Just look at these chairs! One team made a pink ladderback chair and the second photo is a beach chair. Magical, right? I told you. Read a book, tell the kids what to build, and then stand back and watch them! They will amaze you. You are covering reading and STEM, not to mention teamwork, collaboration, art, and science. Win-win! 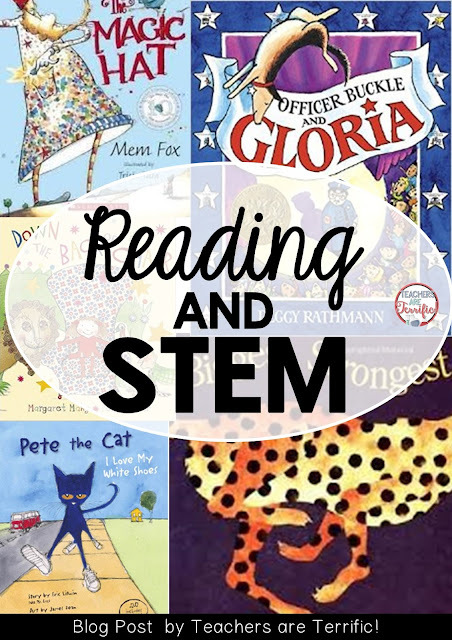 I love this concept of integrating reading and STEM. I teach only Science and not only do I miss teaching reading, the students miss the deeper level thinking associated with sequencing and predicting outcomes, both of which are essential to science experiments. I am inspired to integrate picture books into my curriculum, I have already thought of one on my shelf that lends itself to structure building! Thanks for visiting my blog, Sarah! Kids love to have books read to them and I found the first and second graders loved building something inspired by the book. In fact, one day, I read a book to a group and decided to ask the kids what they wanted to build. After they gave several ideas we voted and then built robot dogs. Have fun! How long did you display what the groups made each time? How many students per group? Good questions! We display items for about a week after making them. These structures are generally held together with masking tape and they will begin to come apart after a week. I take them apart completely and recycle materials and throw away things I can't use. I use groups of 3-4 students. For first and second graders three is a good number. Thanks for visiting! I love these ideas! I just learned that I will be teaching an enrichment class to the K-2 students in my building this year. I am the reading interventionist an due to funding, I have to teach a few enrichment classes as well. I am excited because my principal is giving my free reign to design my own curriculum. I am thinking of alternating between Science and Social Studies. I love these STEM activities. How long did it take for the entire lesson - reading the story and completing the projects? Hi, Karen! Thanks for stopping by! I have 35 minutes for class with first and second graders so we finished in that amount of time. We spent about 5 minutes with the book and then 20 minutes to build, a few minutes to share, and then clean up. If a book is too lengthy I just paraphrase or only show the parts that I need for the challenge. Best wishes with your new job!